The mom who snapped "had tears in her eyes." camera (Rebekka Garvison) Rebekka Garvison said this woman who held her crying daughter for an entire flight is an angel. When Rebekka Garvison boarded her Spirit Air flight from Chicago to Atlanta earlier this week with an infant in tow, she saw the annoyed looks of her seatmates. 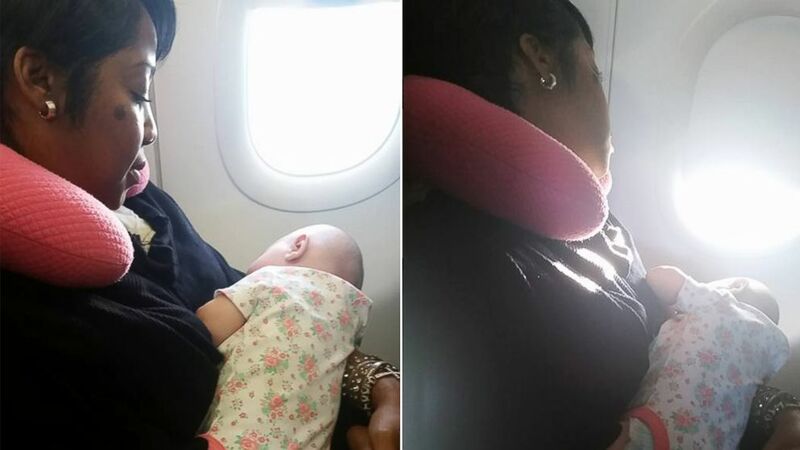 When baby Rylee started crying before takeoff, the situation with her in-flight neighbors didn't improve. "As soon as we got on the plane at 5:30 a.m. it was very quiet and it was a full flight," Garvison wrote in a Facebook post that's now been shared almost 85,000 times. "I noticed that the 2 seats next to me were taken and this couple looked very annoyed and I could tell by their body language sitting right next to me that they weren't thrilled about sitting next to Rylee. Of course I'm already stressing and then Rylee started crying when we were just getting ready to taxi." "[The] next thing I know I was sitting next to this amazing woman! I'm not sure if she could tell how stressed and upset I looked or what, but she turned our day completely around. Rylee wouldn't stop crying no matter what I would try and do ... so she had asked if I didn't mind if she tried and of course I let her. As soon as she had her, Rylee was looking out the window and stopped crying. When we got in the air she fell right asleep and slept in her lap the whole flight until we got to our gate. She kept saying it wasn't a problem at all and it was actually a comforting feeling for her. She even carried her off the plane and held her so I could get the stroller and carseat put back together so I wasn't struggling to try and do it all alone." Garvison told ABC News that her "airplane angel" Nyfesha Miller is "an incredible woman who deserves all the accolades she is getting." "She [Miller] was such a relief and so calming to me. I was already stressed and then seeing everyone else's faces, that just made it even worse." Garvison said she and Miller are in close contact. "Nyfesha Miller," she wrote, "you will never understand how happy this act of kindness has made my family. You could've just rolled your eyes and been irritated like everyone else, but you took her and held her the entire flight and let me get some rest and peace of mind. It brought tears to my eyes while I sat there and watched you and Rylee sleeping next to me. I just couldn't believe how that ended up working out and how caring you were to us. Thank you SO much!! God bless you!!"